The implementation and exploitation of centralized, corporate-wide directories are among the top priority projects in most organizations. The need for a centralized directory emerges as organizations realize the overhead and cost involved in managing the many distributed micro and macro directories introduced in the past decade with decentralized client/server applications and network operating systems. Directories are key for successful IT operation and e-business application deployments in medium and large environments. IBM understands this requirement and supports it by providing directory implementations based on industry standards at no additional cost on all its major platforms and even important non-IBM platforms. The IBM Directory Server implements the Lightweight Directory Access Protocol (LDAP) standard that has emerged quickly in the past years as a result of the demand for such a standard. 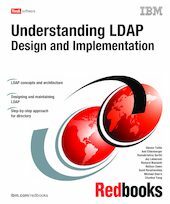 This IBM Redbooks publication will help you create a foundation of LDAP skills, as well as install and configure the IBM Directory Server. It is targeted at security architects and specialists who need to know the concepts and the detailed instructions for a successful LDAP implementation.